Welcome to Shantibu at Mt.Tron in Alvdal, Norway! “Shantibu” means “The Home of Peace”. It combines Sanskrit and Norwegian, East and West: Sanskrit ‘Shanti’ meaning ‘universal peace’ and Norwegian ‘bu’ meaning 'home', which is also Sanskrit (lit. ‘bhu’) and has a wider meaning which stands for ‘everything that has life’. Shantibu is the place where sincere truth-seekers from near and far, and from every corner of the world, come for conversation, guidance, retreat, silence and peace. Here the gate is wide and the ceiling is high – all are welcome and all are being taken good care of. Here there are no “-isms”, dogmas or rituals, but simplicity, naturality and universality. Here no-one is forced to follow a fixed programme but may, if required, have their own, customised, arrangement tailored specifically for them. Here one can completely relax and be oneself in a free and friendly atmosphere. Shantibu is situated at an altitude of 675 metres on the forest-clad slopes of the mighty Mt.Tron in Alvdal, Norway. It is the home of the Swami Sri Ananda Acharya Foundation (est. 1975), Mt.Tron University of Peace Foundation (est. 1993) and Mt.Tron University of Peace Estate Inc. (est. 2010). 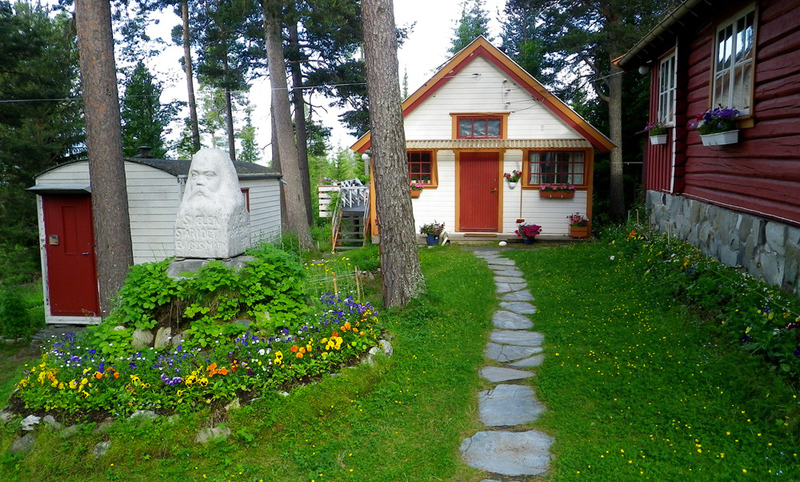 Built in 1946 by Einar Beer who lived here to his death in 1982, Shantibu is now the shelter of Bjoern Pettersen (since 1978) and Tripti Chatterjee (since 1990). Swami Paramananda lived here for a year in 1989-90, and for months at a time during three further visits in the 1990s. Click here to view the beautiful Shantibu in 360x180° view.